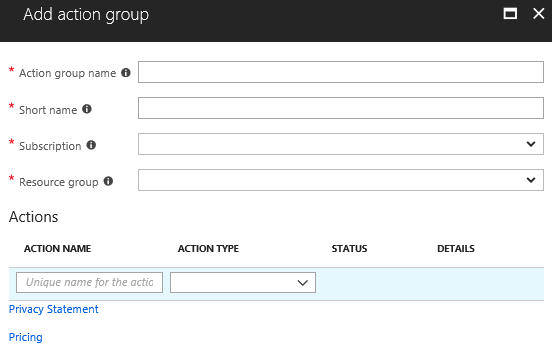 This article shows you how to set up activity log alerts for service health notifications by using the Azure portal. The class of service health notification (Service issues, Planned maintenance, Health advisories). 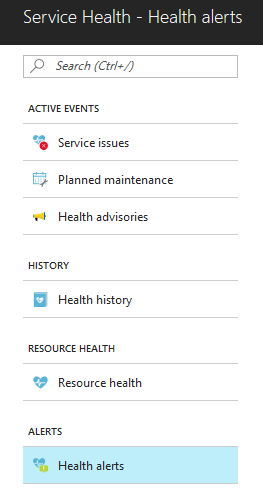 Service health notifications does not send an alert regarding resource health events. Select an existing action group. Create a new action group (that can be used for future alerts). To learn more about action groups, see Create and manage action groups. 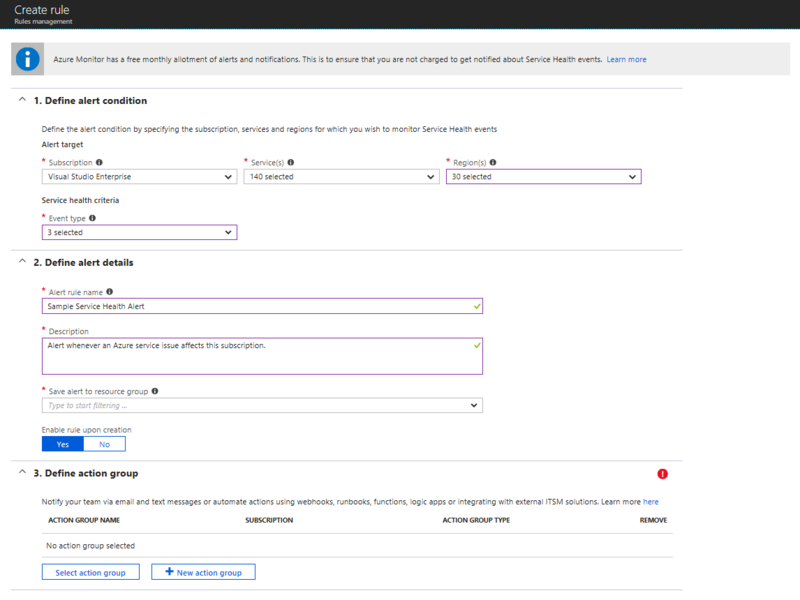 For information on how to configure service health notification alerts by using Azure Resource Manager templates, see Resource Manager templates. In the portal, select Service Health. In the Alerts section, select Health alerts. Select Create service health alert and fill in the fields. Select the Subscription, Services, and Regions you want to be alerted for. This subscription is used to save the activity log alert. The alert resource is deployed to this subscription and monitors events in the activity log for it. Define your alert details by entering an Alert rule name and Description. Select the Resource group where you want the alert to be saved. Create a new action group by selecting New action group. Enter a name in the Action group name box and enter a name in the Short name box. The short name is referenced in the notifications that are sent when this alert fires. a. Name: Enter the receiver's name, alias, or identifier. b. Action Type: Select SMS, email, webhook, Azure app, and more. c. Details: Based on the action type chosen, enter a phone number, email address, webhook URI, etc. Select OK to create the action group, and then Create alert rule to complete your alert. Within a few minutes, the alert is active and begins to trigger based on the conditions you specified during creation. Learn how to Configure webhook notifications for existing problem management systems. For information on the webhook schema for activity log alerts, see Webhooks for Azure activity log alerts. The action group defined in these steps is reusable as an existing action group for all future alert definitions. Follow steps 1 through 7 in the previous section to create your service health notification. Under Define action group, click the Select action group button. Select the appropriate action group. Select Add to add the action group, and then Create alert rule to complete your alert. The following is an example that creates an action group with an email target and enables all service health notifications for the target subscription. Disable or enable it, if you want to temporarily stop or resume receiving notifications for the alert. Learn how to configure webhook notifications for existing problem management systems. Learn about service health notifications. Learn about notification rate limiting. Review the activity log alert webhook schema. Get an overview of activity log alerts, and learn how to receive alerts. Learn more about action groups.